Wisdom, a 67 year old Laysan Albatross is about to become a mother again! 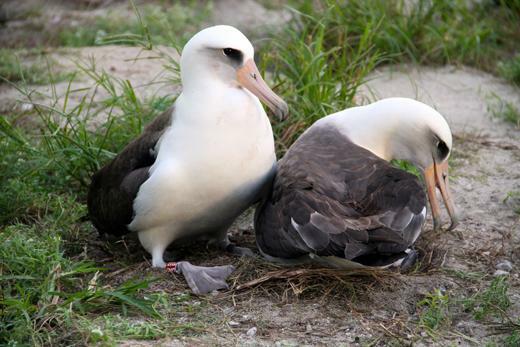 Banded in 1956, she is now the oldest known wild bird. Albatrosses are pelagic birds, flying over water for months at a time, and only returning to land to breed. Wisdom spends most of her time gliding over the Pacific but returns every year to the Midway Atoll to raise another family – one egg, due to hatch in the spring. Albatrosses are amazing birds. They breed mostly in the southern Pacific but can be found on the wing throughout the Pacific. Albatrosses have a wingspan of 10 feet and are able to lock their wings to remain completely outstretched even while they are sleeping, enabling them to stay aloft and cover vast distances over open water to get to their favorite food – squid. They breed only once per year and have only one egg, so its really important their chick survives. The parents will take shifts flying out over the ocean for a week or so at a time to find food, but once the chick becomes large enough, the parents sometimes have to leave the chick completely alone for over a week while they go hunting. The challenges facing albatrosses are immense. Some species nest together on one island making the entire population vulnerable to rising seas, storms or introduced predators. Due to issues like changing ocean temperatures, squid is becoming harder to find and it takes longer for these birds to find enough to feed their chick. Each parent trusts the other one will be successful, but this is not always the case and they may not get back to feed the chick in time. Albatrosses feed at night and off the ocean’s surface – which often contains plastic and other marine debris. And longline fishing vessels which bait hooks with the food albatrosses want are also taking their toll on the birds. This is a species which is vulnerable to a variety of challenges, making Wisdom’s 67 years and yet another offspring a milestone to be celebrated. Read more about these fascinating birds here.